Note: You can enter this giveaway two (2) times per e-mail address per day. Deadline is 11:59PM ET 4.18.19. Time to get fryin’. 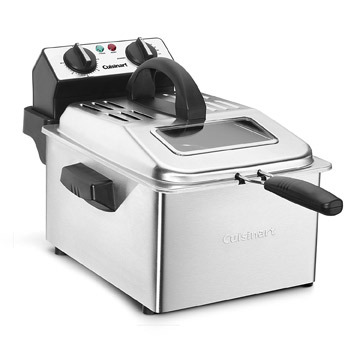 If you’ve ever dreamed of making your own Chili Cheese Fries, Sea Salt and Rosemary Sweet Potato Chips, or Buttermilk Onion Rings, but dread the thought of hot oil splattering all over your kitchen, you’ll love the Cuisinart Deep Fryer. This fryer allows you to fix restaurant-style breaded appetizers, fries, chicken tenders and more at home. The 4-quart capacity oil reservoir lets you cook up to 2.3 pounds of food. The powerful, 1,800-watt deep fryer has a green-light button that lets you know that the oil is ready and the machine has a cool-touch handle so you never risk burning your food or worse, your fingers! NO PURCHASE NECESSARY TO ENTER OR WIN. Void where prohibited by law. Open to legal residents of the 50 U.S., D.C. and Canada (excluding Quebec) who are at least eighteen years old at the time of entry and have internet access. Begins on 2.21.19 at 12:00:00 a.m. ET and ends on 4.18.19 at 11:59:59 p.m. ET. To enter the giveaway, submit your full name and email address on this form. Odds of winning this giveaway depend on the total number of eligible entries received. Only two (2) entries per email address per day. Sponsored by Leite’s Culinaria, Inc. For more information, visit our Official Rules. Be sure to add giveaways@leitesculinaria.com to ensure notification if you are the winner.